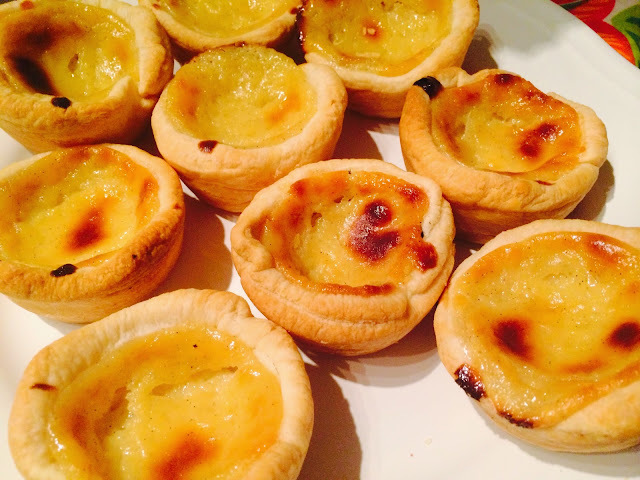 I first became aware of these tarts when I started dating my husband almost 13 years ago. Cakewise I had lived a sheltered life in Finland mostly eating cinnamon buns and bundt cakes, maybe the occasional ginger biscuit. I met my husband on a hot summer night in a Westend nightclub called Cheers. Yes – really, modelled after the US sitcom. Unfortunately or maybe fortunately it no longer exists. The night we met I think I was out with my Aussie flatmate who’d probably already gone home to make herself a vegemite sandwich. She was quite a sedentary girl rarely moving very far from her TV. Surprisingly some months later she accidentally got herself pregnant and sneaked back to Australia to have a pretty little girl and hopefully live happily ever after. So home she went, but as I often did those days, new to London, I partied on. When the handsome tall stranger came to talk to me and offered to buy me a drink I said I’ll just have a water, not because I am in anyway a great advocate of sobriety, but because I was getting pretty tipsy. He romantically got me a bottle a Corona and I remember thinking his eyes were the most beautiful thing I have ever seen on a man. Couldn’t get a word of what he was saying, might have been the music, drink or his accent, but those eyes, oh my word! At the end of the evening he took me to his regular late night coffee shop in Soho for a coffee and a Portuguese vanilla custard tart. We went back often after that, usually after a few drinks in Cheers, Zoo Bar or the little bar next door called Little Italy. Another one of husband’s favourites was a lovely cream filled cannoli. Sometimes we'd share a mortadella sandwich, a fantastic grilled panini filled with mozzarella, tomato, basil and mortadella. That was another thing my husband introduced me to. It was a hot summer, I remember. We’d sit outside with our coffees in the dark warm night and smoke like Turks. I’m sure the saying is not entirely PC, so I looked up some justification and it appears over 30% adults in Turkey are regular smokers. So there. We still go there. We often go for a few drinks in Little Italy by the same owner next door and then get coffees afterwards. These two establishments have seen the entire span of our relationship so far. After our first night and our first Portuguese custard tart together we have been back regularly. I am pretty sure apart from a couple of New Year’s Eves that we’ve spent in Finland we have always toasted the New Year there. We have had some spectacular fights there. Many of them early on in the relationship when we were not living together and I was still in my punctual Finnish frame of mind naively expecting him to turn up when he said he would. I remember once optimistically ordering Jack Daniels and Coke for both of us and finishing them both before ringing him and finding out he’d fallen asleep on the sofa. And on one New Year’s Eve there was a lot of shouting and I stamped my foot so hard that I broke the heel of my new Jones the Bootmaker boot. And after we got back to his place there was a lot of throwing around of Christmas presents, so that he found his eye-cream (my metrosexual man!) in the laundry basket weeks later. I vaguely remember stamping a packet of Jammy Dodgers to death, they are his favourite biscuit, so that was quite evil on my part. I’m not sure what all the stamping was about that night, I’m usually not much of a stamper. I’m much more a door slammer. In recent years the young love’s passion has settled onto smoother paths, so when we still find the energy to go we always have a good time. And when he was ready he proposed to me there as well. The bar staff knew us pretty well by then, Luigi the owner, DJ Keith, the lovely maître d’ whose name I don’t know, the doormen who look like Bond film baddies from Belarus, so there were some celebrations, Champagne and sparklers. I’m sure if we were to have children we’d have to go there to have them. But children are not in the plan, Luigi will be happy to know. Mix the egg, yolks, sugar, corn flower together adding the mix in whisking the mixture until it’s smooth. Place on the hob and bring to boil mixing constantly, keep going until it thickens into a custard. Take off heat and add the vanilla. Pour into a bowl to cool covering it with a plastic bag or cling film. Fold the pastry sheet once and roll so the layers stick together. Fold it into a tight roll and slice into 12 discs. Roll each disc using a little flour into a big enough round to fit to a muffin tin mold. Once you have rolled all 12 put the in the fridge for a few minutes. Oil the molds of a muffin tin and place the pastry into the molds. 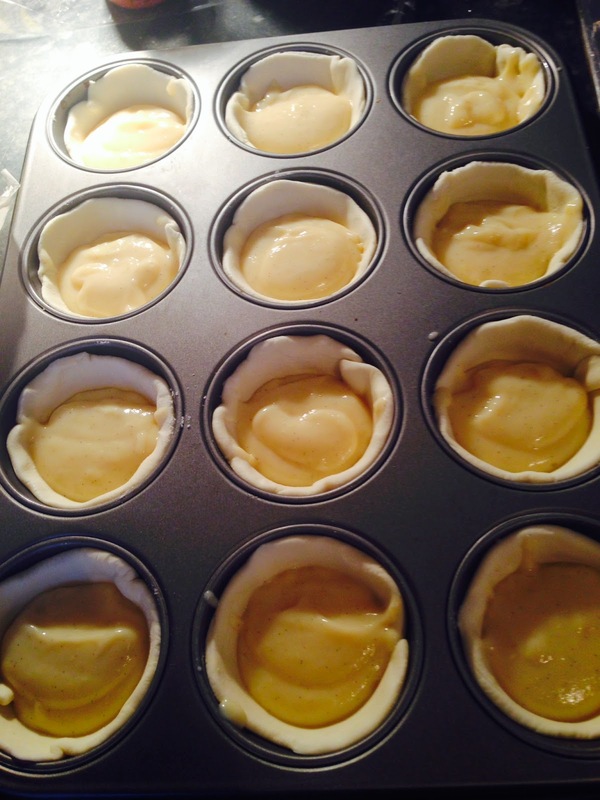 Spoon the custard into the pastry cups. 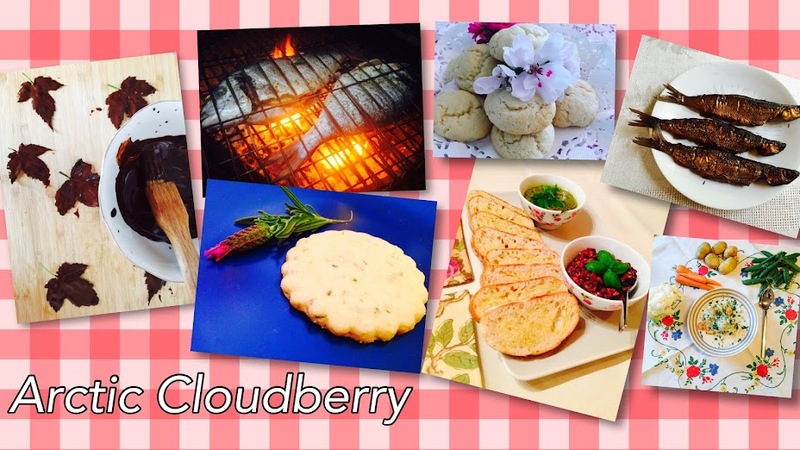 Bake for 25 minutes in 200C or until the tarts look nicely browned on top.